More about iittala Toikka Mari ealized through new and unique techniques, Mari is a refreshing progression of Professor Oiva Toikka's work. The base is left open and the dome-shaped body hollow like her mother, Anna, where she can seek shelter. Toikka carefully considered the color and transparency of Mari which the talented team at iittala's works in Finland bring to life in mouth-blown glass. 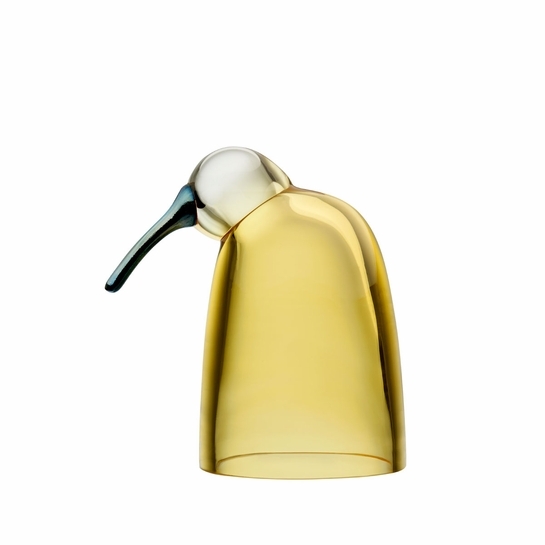 Her pale yellow hue is stunning on its own but gains new warmth when sitting snugly in Anna's protective wings.The birds of Oiva Toikka's 2016 collection are individually mouth-blown by the master glassblowers at iittala�s glassworks in Finland. Each handcrafted iittala Toikka Mari carries the signature �O. Toikka IITTALA� on its baack to ensure authenticity.